Mummy English Muffin Pizzas are easy to make and fun to eat. They are cute for Halloween, plus they are vegan and gluten free! 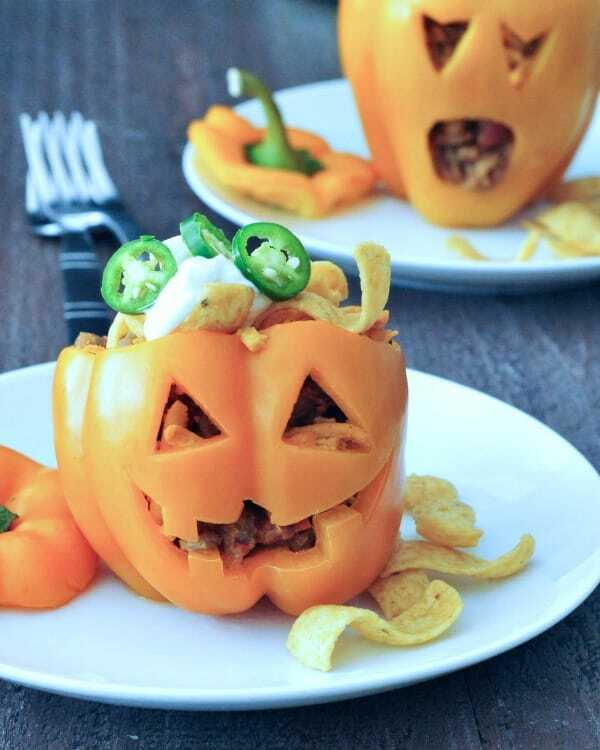 Even though I don’t have children, I have always loved cute Halloween foods. It’s so hard to resist anything with googly eyes! While I am by no means an expert at making creative festive foods, these pizzas are really easy to make. And your kids can get involved, too! Mummy English Muffin Pizzas require only a few ingredients. First you’ll need English muffins. I like to use Food For Life Gluten Free Brown Rice English Muffins. Not only are they gluten-free, they are also vegan. I buy them at at Whole Foods or Sprouts. Even if you don’t buy the gluten-free ones, be sure to check the ingredients to make sure the muffins are vegan. Then you’ll need some pizza sauce. While you can make your own homemade sauce, I usually buy a jar at the store. I like Whole Foods 365 Organic, Trader Joe’s, and Rao’s. And for the eyes you’ll need green pimento stuffed olives, which I usually buy at Trader Joe’s or my local supermarket. Finally, look for vegan cheese slices, such as Daiya Provolone or Mozzarella Style slices. The reason I picked the Daiya ones is because they are round, which works really well for this recipe. But you can use your favorite brand and trim off the excess. 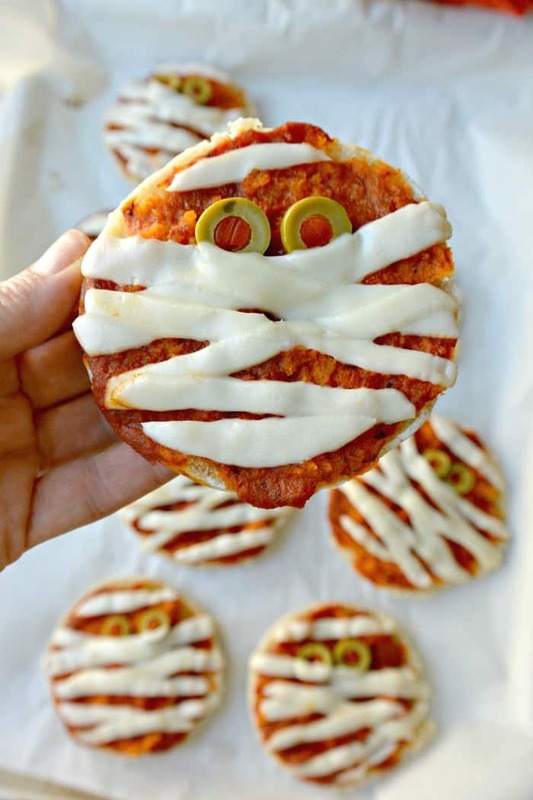 How cute are these Mummy English Muffin Pizzas?! Besides mummies, you could make jack-o-lanterns, witches, ghosts, or whatever you can imagine! And if you can’t find English muffins, you can also make something similar by using a tube of polenta, like in my Mini Polenta Pizza recipe. To round out this Halloween meal, add a simple seasonal salad like Shaved Brussels Sprouts Salad with Hazelnuts and Dried Cranberries. Or serve a make-ahead appetizer like Cauliflower Ceviche or raw veggies and White Bean Dip. Mummy English Muffin Pizzas are the perfect addition to your festive Halloween table. My friends have come up with some of the most creative recipes that kids and adults alike will love. These are some of my favorites you’ll want to check out. 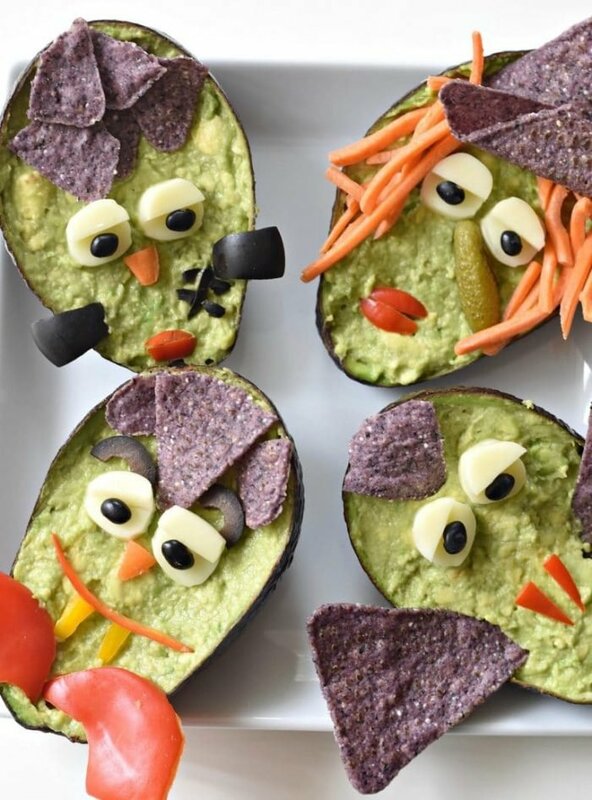 First off are these adorable Halloween GuacaMonsters by Cara of Fork & Beans. And I absolutely love these Frito Pie Pepper Jacks by Kristina of Spabettie! 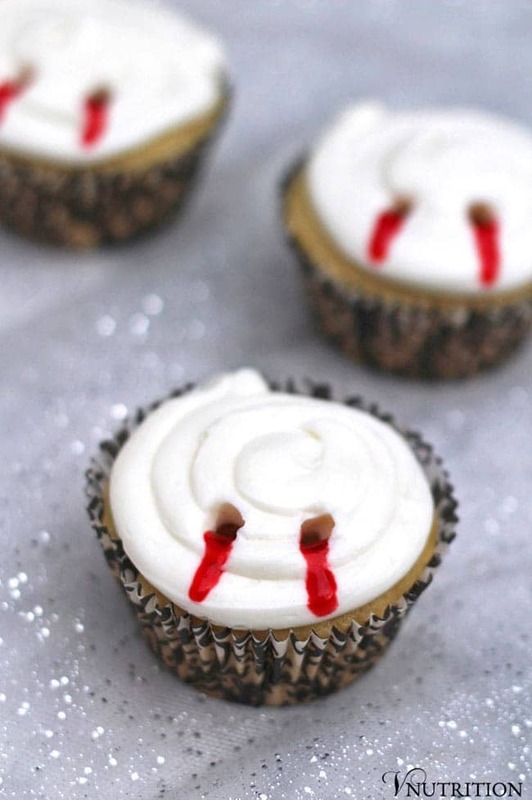 Finally make a batch of these Vampire Bite Cupcakes by Mary Ellen of VNutrition. Use an all-purpose gluten-free flour blend like Bob’s Red Mill Gluten Free 1-to-1 Baking Flour to make them gluten-free. Now let’s get this party started with Mummy English Muffin Pizzas! Line a baking sheet with parchment paper. Split each English muffin with a fork, and place on the baking sheet with the insides facing up. Place a dollop of pizza sauce on each muffin. Smooth out the sauce in a thin layer using the back of a spoon. Place two olive slices on each muffin for the eyes. Slice the cheese slices into quarter-inch ribbons. 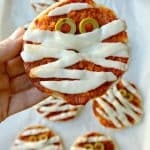 Carefully place the cheese ribbons on the pizza to look like mummies. Use the widest ribbons in the middle. You can slightly overlap a ribbon with the olive eyes to make sure they stay on the pizzas. Bake the mini pizzas for 8 to 12 minutes, until cheese looks melted and the muffins are hot on the bottom.